It was left to rot in a field after crashing in 1943 at the Bombing and Gunnery School in Dafoe, Saskatchewan. A lifetime later, rescued, and its fuselage and other bits and pieces trucked cross-country in 2009 to the Greenwood Military Aviation Museum in Nova Scotia (GAM). That fall volunteers began restoring the Bolingbroke Mk IV-T, registered as #9997, bomber/trainer. In the nine years since, a half-dozen or so volunteers have laboured for more than 16,000 hours to resurrect the bomber, the first aircraft type that the 404 Squadron – active from 1941-45, and reformed in 1951 as the 404 Maritime Reconnaissance Squadron in Greenwood – flew in World War II. The Bolingbroke was the Canadian version, built in Longueuil, Quebec, of the Blenheim aircraft that Bristol Aeroplane Company first produced. The Reynolds Heritage Preservation Foundation of Wetaskiwin, Alberta, donated the “Boly” to GAM. The aircraft had been cannibalized for parts after the crash. A restoration like this takes incredible determination. Among the challenges were the absence of any original blueprints to guide the volunteers. They had to rely on pictures, books, magazines and other existing, restored, Bolingbrokes to get measurements. Then there were the missing and badly damaged parts, plus the need to wheel and deal with other museums for parts. The volunteers obtained some replacement pieces from other Bolingbrokes, fabricated others from scratch, and are still looking for more missing items, like a second nine-cylinder Bristol Mercury engine. 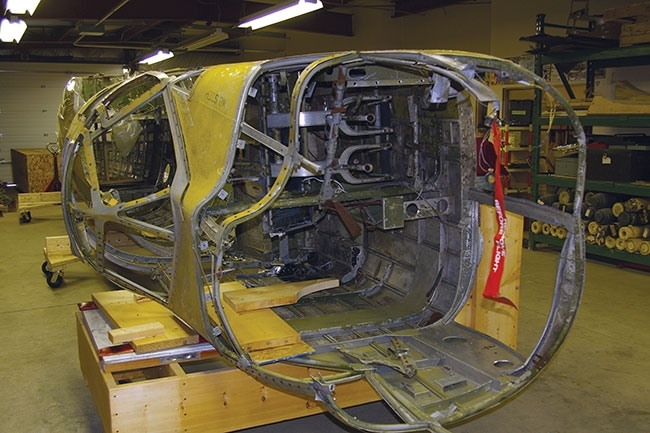 “We have one that came from the Canadian Aviation and Space Museum in Ottawa and are still seeking a second engine to complete the restoration,” says Major Allan Baille, 14 Wing Heritage Officer. Listening to Dan Daigle, a retired military aircraft mechanic and instructor, and now project director and lead restoration expert at the Greenwood museum, discuss the restoration effort, one begins to appreciate the enormity of the challenge in restoring an aircraft in such terrible condition. “We fabricated from scratch the nose, tail and wing skins. We realized that the wing spars were so bad we’d have to completely rebuild the wings. I went back to the Bomber Command Museum [of Canada] in Nanton, Alberta, and picked up two wings that were in better shape and hauled them back to Greenwood on a trailer. I also located the working mechanism for the fuselage turret in Nanton,” Daigle says. The turret, cockpit and nose glass is being replaced by Plexiglas, heated to malleability in a home-made, 64 cubic-foot oven and formed over molds. The mandate of the Greenwood Military Aviation Museum is to collect and show aircraft and artifacts used at CFB Greenwood, or at least examples of the types that were used there. The Bolingbroke fits this bill as an example of, although not one of, the Bolingbroke trainers that flew out of Greenwood. Approaching the museum, the aircraft – most of the 14 the museum owns – on display outside leave no doubt that visitors have arrived at the right place, just a few metres short of the 14 Wing guardhouse. They include a Lancaster, Neptune, Arcturus, Hercules and a Dakota, all of which look huge tucked into the compact, rather amphitheatre-shaped space. An Argus sub hunter, one of the successors to the Bolingbroke that rattled windows as they climbed above the houses, guards one corner of the grounds. To see its still-active successor, the Aurora, just look up. One will soon roar into the sky. Helicopters are in short supply, but an instantly recognizable yellow Labrador, with the signature double reverse lightning bolt, is on display, and a Piasecki/Vertol H-21/H-44, (better known to many Canadians simply as the “flying banana”) was moved this fall from the restoration workshop to the grounds for display. Inside, the museum offers a surprisingly intimate experience. This is partly because it is absolutely packed with aircraft hardware, paintings, photographs, models, uniforms, descriptive displays and much, much more, and partly because it is so clear that this is as much a museum about people and their squadrons and missions as it is about aircraft. For example, there are 58 paintings by the Greenwood Art Association, including portraits of airmen who served out of Greenwood. Over 200 tiny model airplanes built by Donald Lee – trained as a RCAF pilot during WWII and re-mustered as a flight engineer – and donated by his wife after his death in 1995, fill display cases just inside the entrance. The displays range from a write up on the Royal Air Force Distinguished Flying Cross to a Rolls-Royce Nene 10 engine from a T-33. Nearby, a restored Sperwer unmanned aerial vehicle dangles from the ceiling; and below it, visitors can take a close look at its on-board camera and circuitry. Early days in the restoration of Greenwood Museum’s Bolingbroke bomber. In the newest section of the museum is an Avro Anson Mk II. Beside it, a photo display shows some details of how the museum volunteers restored this beautiful plane. They completed it in 2009 after five and a half years and 16,528 hours of work. There is information and memorabilia on the Wing Squadrons, 405 Long Range Patrol Squadron, including its standard, 415 Swordfish Squadron, and an active display of the 404 Buffalo Squadron. An large scale model of a Spitfire occupies a good chunk of prized floor space. The displays, which cover nearly every available surface, are a visual buffet. They include stained glass, war medals, German helmets, and a model of a USS Growler sub. There are many write-ups of events, such as the February 9, 1945 Black Friday aerial attack by 404 Squadron on German ships. Another explains Canada’s role in the Cuban missile crisis. There is a display of WWII Victoria Cross airmen, male and female mannequins in uniform, and cabinets full of radio gear, model ships and various uniform caps. A 36-panel history of the Greenwood base runs the length of a wall beside the actual Argus Tactical Crew Procedures Trainer used to train Argus crews. Visitors can saunter through it and listen to a recording of an actual submarine hunt. Live displays include a cabinet holding a war scene, animated with light and sound, of what the write-up describes as “A typical bomb run with 405 Squadron… what the bomb aimer would see through his circular window in the nose of a Lancaster aircraft.” Another live display is titled 413 Squadron crew finds the Japanese fleet, depicting an April 4, 1942, event in which RCAF pilot Leonard Birchall, who spent time flying out of Nova Scotia, spotted a fleet of Japanese ships steaming toward Ceylon to attack the Royal Navy’s Eastern Fleet. For Grade Six students, the museum runs a Flight Education Program. This includes a Search and Rescue corner featuring a large model of a Labrador, parachutes being used as shelters, and mannequins dressed in their SAR gear. Large action photographs, posters, models and SAR tools of the trade, such as a rescue basket, tell more of their story. Elsewhere, students learn about an ejection seat, flight controls, engines and propellers, and how an air-dropped torpedo works. And lest we forget history as it unfolds under the feet of today’s active soldiers, there is a panel containing 165 photographs of Canadian soldiers who have lost their lives in the conflict in Afghanistan. This is a museum well-worth visiting.